WASHINGTON - President Donald Trump said Wednesday the U.S. hasn't been notified about North Korea's threat to cancel his planned summit with Kim Jong Un next month. North Korea threatened earlier in the day to scrap the historic summit between Trump and Kim, saying it has no interest in a "one-sided" affair meant to pressure the North to abandon its nuclear weapons. Trump maintained that he'll still insist on the country's denuclearization should the summit go on. WASHINGTON - President Donald Trump says the U.S. hasn't been notified about North Korea's threat to cancel his planned summit with Kim Jong Un next month. But Trump says he'll still insist on the country's denuclearization. 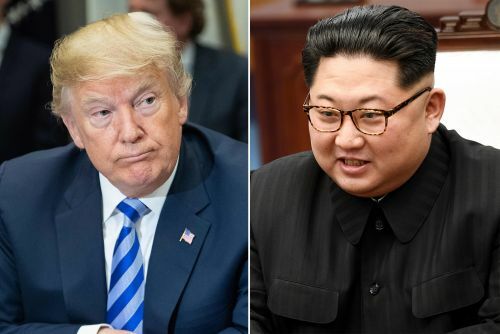 North Korea on Wednesday threatened to scrap the historic summit next month between Trump and Kim, saying it has no interest in a "one-sided" affair meant to pressure the North to abandon its nuclear weapons. Trump said Wednesday as he welcomed the president of Uzbekistan to the White House that "We haven't been notified at all" about the threat.